(Nanowerk News) In a novel use of gene knockout technology, researchers at the University of California, San Diego School of Medicine tested the same gene inserted into 90 different locations in a yeast chromosome – and discovered that while the inserted gene never altered its surrounding chromatin landscape, differences in that immediate landscape measurably affected gene activity. The findings, published online in the Jan. 3 issue of Cell Reports ("Decoupling Epigenetic and Genetic Effects through Systematic Analysis of Gene Position"), demonstrate that regulation of chromatin – the combination of DNA and proteins that comprise a cell’s nucleus – is not governed by a uniform “histone code” but by specific interactions between chromatin and genetic factors. 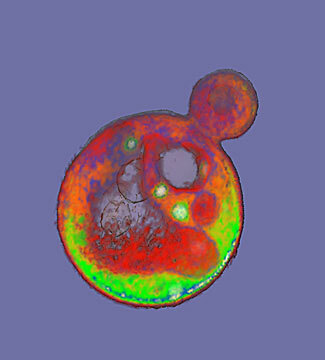 An x-ray micrograph of a yeast cell, Saccharomyces cerevisiae, as it buds before dividing. The Cell Report findings indicate that there is no singular universal code, according to Ideker. Rather, the effect of epigenetics on gene expression or activity depends not only on the particular mix of histones and other epigenetic material, but also on the identity of the gene being expressed. To show this, the researchers exploited an overlooked feature of an existing resource. The widely-used gene knockout library for yeast, originally created to see what happens when a particular gene is missing, was built by systematically inserting the same reporter gene into different locations. Ideker and colleagues focused on this reporter gene and observed what happens to gene expression at different locations along yeast chromosome 1. “If epigenetics didn’t matter – the state of histones and DNA surrounding the gene – the expression of a gene would be the same regardless of where on the chromosome that gene is positioned,” said Ideker. But in every case, gene expression was measurably influenced by interaction with nearby epigenetic players. Ideker said the work provides a new tool for more deeply exploring how and why genes function, particularly in relation to their location.